Transportation is an essential prerequisite to any city’s socio-economic growth. Safety, accessibility, reliability, time saving and comfort, govern mode choices. In Indian cities, bus transport system has been a primary public transport mode over the past many decades. Though various ULBs have made efforts to provide affordable public transportation through bus systems, not many cities are successful in increasing public transit patronage, let alone retain their existing commuters. The conventional ways of operations and management had lead to degradation in quality of commute and service levels. This had lead to increasing private vehicle dependence resulting in congestion, air quality degradation and road safety issues in cities. The Indian bus systems required a transformation not only for delivery of service level but also enhancing its brand image and making bus as a preferred choice mode. With the wake of 21st century, in many cities, ULBs with the help of state and central governments and technical consultants, have initiated Bus Rapid Transit (BRT) system. The India experiences show that implementing BRTS has been way difficult but the fact is that it is inevitable to the mass transport system. Though BRT capacities are based on its design features, it can achieve capacities equivalent to rail based systems. Considering its multiple benefits compared to rail based systems, BRT systems in Indian cities were particularly built with stronger image and better service levels. These with effective branding and communication strategies have helped attract more public patronage. Each city has its own spatial context and opportunities to be explored. Bus systems designed with consciousness can be adapted to city context and meet demand. 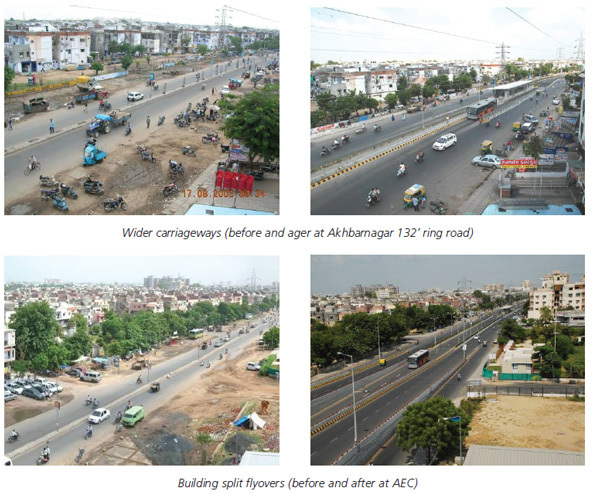 BRT, a concept alien to Indian cities, when designed to adapt to local context ensured its acceptability and delivers desired efficiency in Ahmedabad, Surat and Hubli-Dharwad. On one hand, Hubli-Dharwad had an obvious choice to consider axial corridor as a potential BRT with enhanced efficiency and capacity through an optimized network of trunk and feeder service. On the other hand, Ahmedabad and Surat required a conscious and visionary planning for corridor selection and developing a network that connects city’s major nodes. It is not necessary that BRTS should be always planned to serve the existing travel patterns and desire lines, but it can also be developed to alter land use and travel patterns to more sustainable living. The spatial analysis of travel demand based on the 2007 household survey undertaken as part of BRTS study showed that the production and attraction centres are distributed well all over Ahmedabad. The city being polycentric in nature, the efficiency of system would not have been sufficed through limited/isolated corridors. 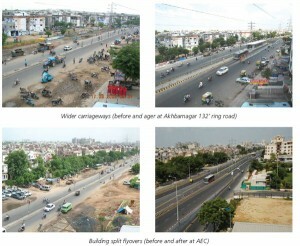 Hence, the key decision of building a ‘BRTS network and not just corridor’ became focus of planning and implementation. The pilot corridor of 12.5km was inaugurated in October 2009 catering 18,000 passengers. Currently 96km (86km dedicated) BRTS network is operational, ferrying 1.45 lakh passengers daily. The city today experiences reduced congestion levels and improved air quality due to mode shift of passengers from private vehicles to BRT system.